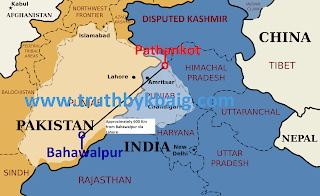 Truth by Kbaig: Pathankot Airbase Attack...? To neutralize only 6 terrorists Indian forces equipped with lethal modern weapons took 100 hours. 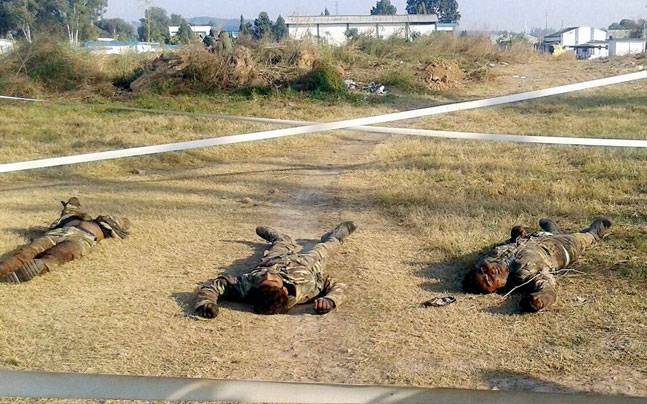 India, who claims to be the unchallenged super power of the region, after struggle of 4 days, Indian commandos succeeded to clear the airbase from terrorists but this suspicious incident left many questions regarding capability of Indian army and other related agencies, actual number and identity of terrorists etc. These questions are to be answered by Indian govt. but they will never answer them. Indian media following the old tradition exploited this incident for propaganda against Pakistan but first time BJP leaders, Modi and Federal Ministers adopted careful attitude in their statements in spite of blaming Pakistan. Based on this careful attitude by Indian leaders, elements in Pakistan suffering with the syndrome of Indian friendship attempted to realize the nation that India has always been willing to have friendly relations with Pakistan. 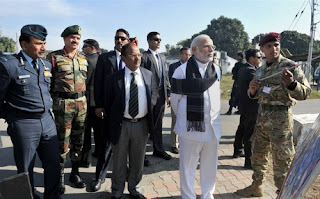 Obviously, the careful attitude by Modi or his extremist Hindu leaders over alleging Pakistan in Pathankot airbase is apparently a positive change but we should wait a little because in the end Indian investigation agencies will blame non-state actors of Pakistan. In the propaganda against Pakistan, Indian media said that these terrorists might have the support from India but they were Pakistani. 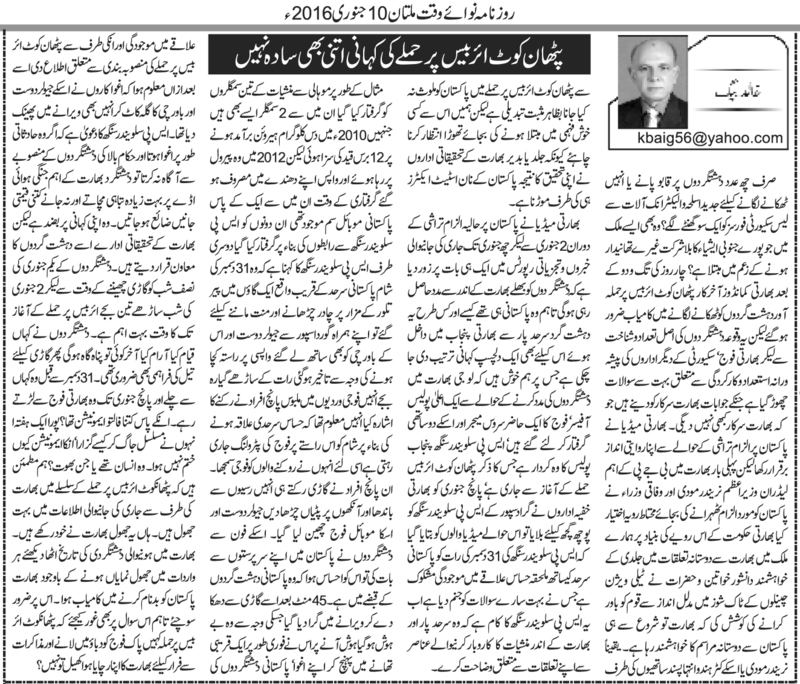 An interesting story has been fabricated as well that how and when they entered into Pakistan. We are happy that an on duty Major and his two colleagues from Indian army along with SP of Indian Punjab Police have been arrested. 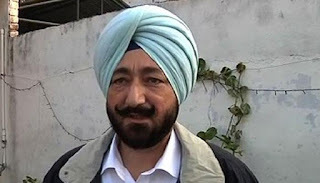 SP Salwinder Singh is that character who is being mentioned since attack on Pathankot airbase. On 5 January 2016, Indian secret agencies called him for investigation and media was told that his presence with the Pakistani border on night of 31 December 2016 is suspicious which has raised many questions. Now Salwinder Singh has to explain his links with drug peddlers within India and across the border. Three drug smugglers were arrested from Mohali, 2 of them were previously arrested in 2010 and sentenced 12 years of imprisonment due to recovery of drugs. In 2012 they got released on payroll and started their business again. At the time of arrest, allegedly they had one Pakistani Mobile SIM and they were arrested due to links with SP Salwinder Singh. SP Salwinder Singh is of the view that he went on the night of 31st December 2016, to the grave of a saint Pir Talwar along with his Jeweler friend and his cook. They got late on their return because of unpaved way, at about 11:30 pm they were stopped by few persons wearing uniforms of Indian army. They stopped him, he was aware that this is a sensitive area and Indian army patrols here, thus he stopped his vehicle. As soon as the vehicle stopped, the persons in Indian army uniform tied them up with the ropes and put masks on their face. When they called into Pakistan from the mobile of SP Salwinder Singh and his Jeweler friend, he realized that they were in the control of Pakistani terrorists. After 45 minutes terrorists threw him in a deserted place and he got unconscious. When he came to his senses, he reported their abduction to nearby Police station, informed the authorities about presence of Pakistani terrorists and their plans to attack Pathankot airbase. Afterwards, he was informed that terrorists had cut the throat of his Jeweler friend and cook and threw dead bodies in a deserted place. SP Salwinder Singh claims that if he had not been accidentally kidnapped and not informed Indian authorities, terrorists would have caused heavy destruction on Pathankot airbase and many lives would have been lost. He is stuck to his version of Story but Indian investigation agencies allege him for supporting terrorists. The time from snatching of the vehicle at the midnight of 1st January to 02 January 2016 is very important. Where did terrorists rest at least they should have somewhere to hide and take rest and refuel their vehicle. 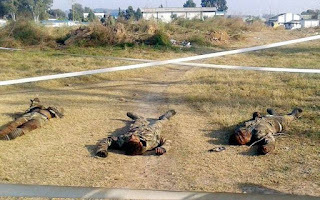 From where did they start their journey before 31st December 2015 and kept fighting with Indian army till 5th January. How much spare ammunition did they had? How did they spend a week without sleeping? Why did not their ammunition end? Were they humans or ghosts?